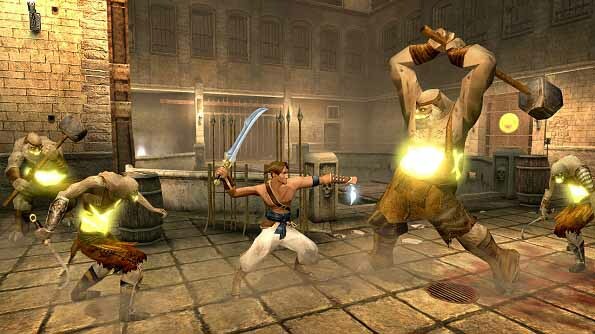 Free download Prince of Persia The Sands of Time game for PC. It is a third person action and adventure video game published by Ubisoft. Prince of Persia The Sands of Time was released in 2003. Here is an official trial version, from where you can play some missions. In a complete full version of Prince of Persia The Sands of Time, game starts where prince is outside the palace. You have to enter the palace to start the mission. The mission of the game is to get back the sands of time. Prince enters the palace and moves forward by killing his enemies. Prince has only a sword at the start. The graphics of game is very nice and it is completely 3D game. You have to play using mouse and keyboard both. Mouse is used to attack and change the direction. You can check controls option from game options. For your quick consideration, you have to use A, S, D and W keys to move forward, backward, left and right. Mouse is used to change the direction of the player. To attack, use left click of mouse while the right click is used for special action. For example, if you want to climb up a tall wall, press W and just nearby the wall, press mouse right click too. Similarly, if you want to cross a long way with broken bridge, you can run on wall. To do so, move forward beside the wall and at the edge of the broken bridge, press right mouse click. You must keep pressing W button. This will help prince to run on the wall toward the next edge of the bridge. Shift key is used to walk slowly. You can pass through ground hurdles, e.g. blades outside the ground. To jump, use spacebar. If the life bar is down at any stage, search for water. Drinking water will increase the life bar of prince. Use mouse right click to drink water. You can also block the attack of enemies using mouse right click.